How did I find my way into yoga? I clearly remember when I started practicing regularly enough that yoga really started to mean something to me. It was after I had spent my last college semester studying and working abroad and had continued on with further work and traveling abroad following my graduation that I returned home to Maine to ground myself but felt lost. I grew up as a competitive gymnast so yoga was what I had been yearning for for years and fortunately, was love at first encounter. At the time, I was practicing yoga in friends’ basements in front of yoga DVD’s and was immediately drawn to both Vinyasa, and Iyengar classes (eventually Kundalini too) at yoga studios. While trying to determine what direction I would take in my life and achieve all that I thought I was supposed to attain after college, yoga was giving me the tools to see more clearly, be patient and accepting of the unknown, and was providing a tremendous amount of stress relief. What is my practice like off the mat? And how do I live my yoga? For me, it’s difficult to distinguish much difference between my practice on and off the mat. The way I live my yoga is an example of Richard Freeman’s first words in his book The Mirror of Yoga, which states “Yoga begins with listening.” Yoga has taught me how to engage in life’s daily tasks with more awareness, meaning and purpose. I have a daily asana (mostly rooted in the Iyengar & Ashtanga systems) practice of some sort, and I am continuously working on cultivating a daily (usually short) seated meditation practice. 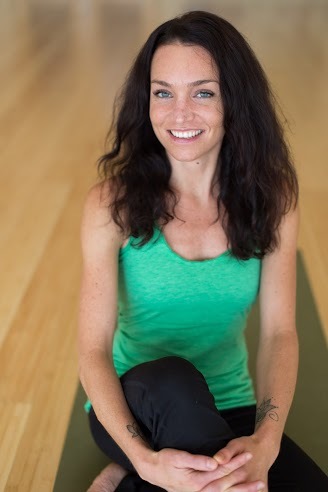 Yoga as an educational experience has always been something very enticing to me, and inspires me as a teacher, so I live my yoga by remaining a devoted student so I can forever be immersed in my own self study. I teach so that I can serve as a bridge between all of my gifted mentors to our wonderful community of students with the intent to share all that I learn. By tuning in and aiming to live by the endless amount of lessons the practice has to offer, yoga expands my consciousness from everything to what I choose to eat, who I spend time around, remembering what is of essence, and the importance of love , gratitude and forgiveness. What is my favorite thing about the Lila community? The maturity and dedication of the students and teachers! The sacred space that has been created at Lila makes me feel so at home both as a teacher and a student, which I have found to be a unique blend in our community. Each student and teacher at Lila understands that yoga is not just a physical activity so I am continuously inspired by the ‘yoga as a life practice’ commitment at the studio. Which pose is your asana nemesis? I honestly can say I do not have one specific nemesis pose! I love the distraction from daily life that a good challenge provides. From a student perspective, I loathe any pose where I don’t get ample time to at least take one steady, clear breath.